Ask fellow campers about "Black Moshannon State Park" and nearby attractions. Our site took us hours to level our rv. We tried every conceivable angle, leveling board configuration and trick in the book! The loop had no restrictions on where you could walk your dogs, but had about 6 sites that didn't allow pets which were located across from pet allowed sites. What is the point? Because we unknowingly came 1st day of trout season, ALL sites that had electric and allowed dogs were filled. Those that said "no pets" were unoccupied. Would have loved to have been able to move to a more level site, but we travel with dogs. Those are the only complaints. We had limited cell sevice (Verizon), no internet. Nice family and outdoor recreation park. Friendly fellow campers. Many of the sites have a paved "patio". Ours (and others) was located on the utilities/connection side of our rv and not on the awning side. So I think the pad is there for a tent. We could not park our rv or tow car on the pad. We camped at Black Moshannon State Park in a Motorhome. 90 minute drive to Benezett and Elk Visitor Center. Worth the trip! Note that Dogs must stay in the car at the visitor center and on trails. We enjoyed the informative 4D movie about elks in the center: 20 minutes long. Veterans get in free. Others pay $5. We had no cell or gps service in Benzette. Recommend you pre-plan your general route in advance if you plan to go anywhere else in the area. One of our favorite Pennsylvania State Parks! Very clean with updated bathrooms. Some full hook up sites. Rangers have activities on the weekends. Free pontoon boat rides in the morning by the ranger. Nice lake for kayaking. Very nice camp store that serves food and ice cream. You can walk to everything from the campground. We camped at Black Moshannon State Park in a Travel Trailer. State College is a short drive away where you can get ice cream from the famous creamery! Full hookups available. Sites were large with ample space between campers. Could only get a cell phone signal standing in the road and it was still weak. Picked up NO TV stations with RV antenna. Lake had limited shore fishing due to lily pads. Trout streams were very shallow when we went. Site 46 is across from T in the road, so at night headlights shined into campsite often. We camped at Black Moshannon State Park in a Travel Trailer. Take an afternoon to head into State College and visit the Penn State Creamery and Happy Valley Brewing. This is a nice enough park, but is a bear to get to and is not recommended for a simple overnight stay. The road into and out of the park is pretty steep and hard for a larger RV. Maneuvering in the campground is also rather tight. When we were there (off season) the lake was down quite a bit, making it not as attractive. When we went by the park office the attendant made us wait while she finished some paperwork before she would talk with us. Not the best customer service, but not a really big deal. The rate reflects off-season and senior discount. Do note that the pet sites cost more even if you do not have a pet. We would probably not stay there again. We camped at Black Moshannon State Park in a Motorhome. My kids (ages 12 and 15) absolutely love this park! The campground is close enough to swimming and fishing that they can walk or ride bikes. This is a state park, so all that is available is water as far as hookups, but the location and surrounding activities make it awesome. The rangers patrol on foot at night and passed several times that I saw. The sites are very spacious and in some cases secluded. 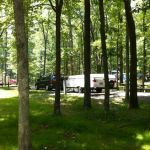 We camped at Black Moshannon State Park in a Travel Trailer. This is one of the best campgrounds we have stayed in. Facilities are modern and in good repair. DCNR (security) circled camp loop more than once at night. No partiers in this park while we were there. There are many trails in the area. The big attraction is the nearby lake. There is a beach for swimming. Boat rentals are also available. I highly recommend a stay here. We camped at Black Moshannon State Park in a Motorhome. Are you affiliated with Black Moshannon State Park ?